You will have quick access to important insights that help in the assessment of your health: highs, lows, daytime, nighttime and best day. Additionally, you can find your average glucose reading and risk for hypoglycemia and more. With Dexcom CLARITY’s compare feature, you can evaluate your glucose improvement over time. Identify problem areas with the comprehensive data tool and evaluate if your diabetes management solutions are working. Dexcom CLARITY offers insight to patterns and potential management solutions to discuss with your health care team. Dexcom CLARITY’s Ambulatory Glucose Profile (AGP) is a licensed, standardized glucose report created by the International Diabetes Center (IDC). AGP provides a big picture view of your diabetes management and is only one part of understanding your glucose patterns. View glucose patterns, trends and statistics and get weekly notifications* to know how much time you spend in your target range, anytime, anywhere! 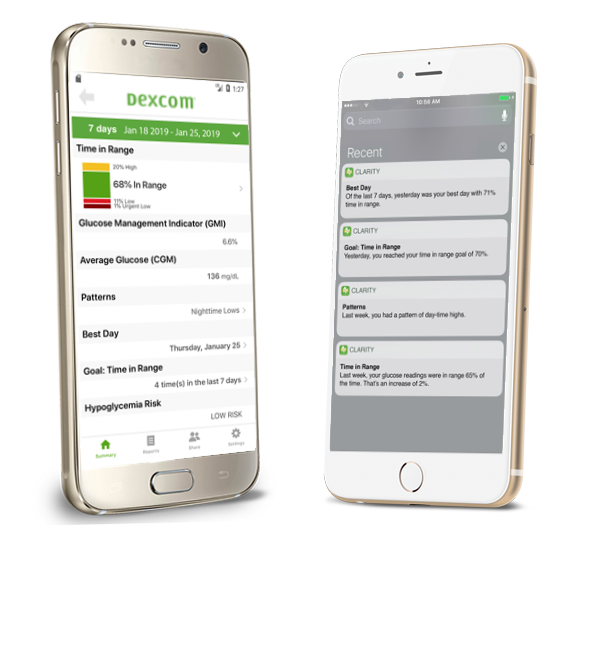 Log in with your Dexcom account information to view patterns and trends so you can make informed decisions to help you manage your diabetes. Check in with the Summary dashboard to track your progress. With Reports, you can view, save, print or email any or all of Dexcom CLARITY's reports. Tap Share to accept your clinic's sharing code so they have access to your data to make your appointments more efficient. Please note: Notifications and emails only available when used in combination with the Dexcom CGM system on a compatible smartphone. * Users must opt in to receive notifications in the app settings. Looking for more information about Dexcom CLARITY? Browse through our frequently asked questions (FAQ) to find answers. Will events entered into my Dexcom receiver or Dexcom CGM app show in Dexcom CLARITY? If you enter events such as carbs or exercise on both your receiver and your smart device, then both the receiver and the smart device must be uploaded to Dexcom CLARITY to show complete data and accurate statistics. Smart device entries take about 3 hours after the event is entered in the Dexcom CGM app. Receiver entries appear immediately once uploaded. How do I set up data sharing with my clinic? Your clinic uses their Dexcom CLARITY clinic account to invite you to share data with them on an onging basis. The invitation includes a sharing code that you enter in your Dexcom CLARITY account on the Settings page. You can also accept the Sharing Code using the Dexcom CLARITY app. Once you’ve entered the share code, your account and your clinic’s account will continuously share data between them. Remember, if you use a Dexcom receiver, you will need to upload it to CLARITY for the data to be up-to-date. If your clinic does not have a Dexcom CLARITY clinic account, your healthcare professional can still view your data from the clarity.dexcom.com/professional page of CLARITY. You use the Dexcom CLARITY app to generate a sharing code requested. You can also email and print reports from Dexcom CLARITY and the Dexcom CLARITY app prior to your appointment. How does Dexcom CLARITY get my data? If you use a receiver, you log in to CLARITY from a computer, connect your receiver, then follow CLARITY’s Upload Instructions. The data stored on your receiver will appear instantly. Dexcom receivers store about 30 days of CGM readings with 120 Calibrations. It is important to upload Dexcom receiver data to CLARITY at least every 30 days to ensure data is not lost. If you use a smart device, CLARITY receives your data automatically from the Cloud and is displayed in CLARITY about 3 hours later. This means that with a smart device system, the most recent data you view in CLARITY is at least 3 hours old. Brief Safety Statement: The web-based Dexcom CLARITY® software is intended for use by both home users and healthcare professionals to assist people with diabetes in the review, analysis, and evaluation of historical CGM data to support effective diabetes management. It is intended for use as an accessory to Dexcom CGM devices with data interface capabilities. Caution: The software does not provide any medical advice and should not be used for that purpose. Home users must consult a healthcare professional before making any medical interpretation and therapy adjustments from the information in the software. Caution: Healthcare professionals should use information in the software in conjunction with other clinical information available to them.